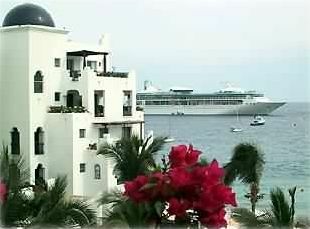 Bargain Price for Beachfront Luxury Suite at Cabo! Luxury suite in Pueblo Bonito-Cabo San Lucas on the swimming beach with views of the bay and Land's End. Luxury RCI Gold Crown resort with all amenities. Convenient five minute walk to downtown and many great restaurants. Immediate access to beach and water sports activities. Beautiful pool, spa, and two restaurants on premises. Close to premier golf courses and the world's best sport-fishing. Suite has two full-size beds in private bedroom and full-size futon bed in living room. Private balcony has great views. Centrally located for best views and most convenience.